The Midnight Falls trail is located in the Broadmoor Seven Falls Park in Colorado Springs, Colorado. The short trail begins at the shelter that is at the top of the Seven Falls stairway. From there it travels through a thick forest of towering White Fir, Douglas Fir and occasionally a few aspen trees. Upon arrival hikers can enjoy the tranquil setting of the mountain stream flowing over Midnight Falls as it heads toward Seven Falls and the canyon below. The Midnight Falls trail begins at the storm shelter at the top of the Seven Falls. Lightning during thunderstorms can apparently be a problem in the area. There is a warning light and siren on top of the shelter for hikers to take cover at such times. Even though the Midnight Falls trail is relatively short and easy hikers will have to first tackle the Seven Falls trail and staircase to get to this point. 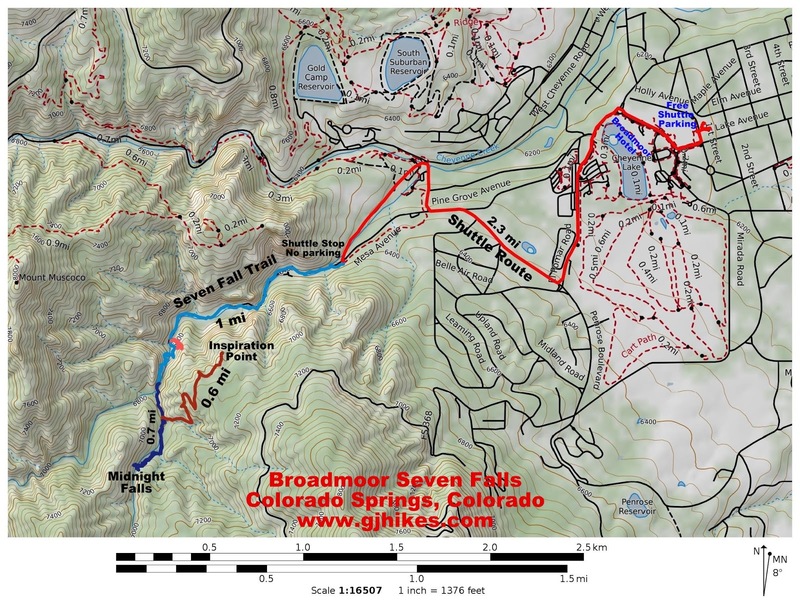 Compared to the paved route that the Seven Falls trail follows the Midnight Falls trail is a little primitive with an occasional rock or two in the path to step over. Interpretive signs along the trail make mention of the different types of trees as well as wildlife. After hiking about a tenth of a mile the trail comes to a fork where the Inspiration Point trail breaks off on the left. The trail forks again after a short distance with the route to Midnight Falls following the branch on the right. From there the trail continues working its way through the trees with the rippling sounds of Cripple Creek flowing nearby. 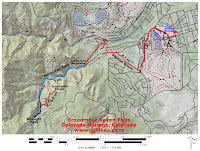 Every so often someone on Broadmoor's Soaring Adventure might be heard zipping by overhead. Those that would like to sit and relax and take it all in will find benches fashioned out of logs just for such an occasion. Having journeyed down Cheyenne Mountain, Cripple Creek continues over Midnight Falls. Nearby debri hints that at times the creek can get quite violent but on this day the stream is a leisurely flow. Before heading back down the stairway at Seven Falls hikers might want to consider also checking out the Inspiration Point trail. It is a bit more difficult than the Midnight Falls trail but that is only because it has about 230 feet of elevation gain. As far as the Midnight Falls trail goes if you would like to see it for yourself then all you have to do is 'Take a hike'.